Got trouble connecting? There’s an algorithm for that. Photo by suttonhoo on Flickr. A selection of 13 links for you. Now the work starts. I’m @charlesarthur on Twitter. Observations and links welcome. Computer boffins Juan Echeverria and Shi Zhou at University College London have chanced across a dormant Twitter botnet made up of more than 350,000 accounts with a fondness for quoting Star Wars novels. Twitter bots have been accused of warping the tone of the 2016 election. They also can be used for entertainment, marketing, spamming, manipulating Twitter’s trending topics list and public opinion, trolling, fake followers, malware distribution, and data set pollution, among other things. In a recently published research paper, the two computer scientists recount how a random sampling of 1 per cent of English-speaking Twitter accounts – about 6 million accounts – led to their discovery. Amazing. It’s essentially the same thing as botnets on PCs, but – presumably – for propaganda. 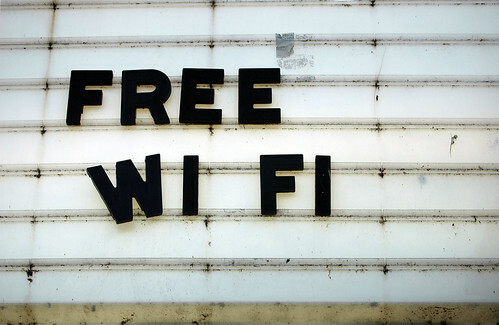 The researchers say that Wi-Fi connections fail an astonishing 45% of the time. And the time they take is hugely variable, with 15% of connections taking more than five seconds. Having found the factors that slow down connections, the team has created an algorithm that avoids the most obvious compromises and so speeds up connection times… The algorithm reduces connection failures to a rate of just 3.6% and reduces connection times by a factor of 10.
at January’s Consumer Electronics Show (CES), also in Las Vegas, commentators were struck by how many devices incorporated Alexa. And Amazon is even stealing into Google’s territory: some phones sold in the US from China’s Huawei, which uses Android, will incorporate Alexa rather than Google’s Assistant programme. What analysts wonder is: how can Home bridge that revenue gap? So far, Google hasn’t explained. Even if it can fend off the Echo, it may not be able to defend its core business. I considered getting an Echo the other day. But then I asked myself quite what I, and everyone else, would use it for. The feeling passed. However it still feels like a threat to Google. Apple is accusing Qualcomm of withholding $1 billion in rebates under a deal they had struck to keep Qualcomm modems in Apple products, including the iPhone and iPad. Qualcomm held the rebates after Apple worked with Korean antitrust regulators looking into Qualcomm’s licensing businesses, Apple said. Earlier this week, the FTC accused Qualcomm of monopolistic practices directly related to its intellectual property licensing business and cited its relationship with Apple. “Apple has intentionally mischaracterized our agreements and negotiations, as well as the enormity and value of the technology we have invented, contributed and shared with all mobile device makers through our licensing program,” Qualcomm general counsel Don Rosenberg said in a statement. Apple said that Qualcomm charges Apple “at least five times more in” royalty payments than all of Apple’s other patent licensors combined in a statement provided to Business Insider. The third advice is to take a harder and more sober look at America’s endemic problems. Mr Trump is right when he says there is a lot to be fixed, but wrong when he implies that it is all about wrenching back jobs from Mexico and China. It is about flaws in America’s own economy, society and public policy. A new composite statistical index shows how western countries are shaping up in the face of the long-term trends of this century, including ageing populations, technological innovation, the knowledge society and globalisation. On the Wake Up 2050 Index, the US comes a shocking 23rd out of the 35 OECD members ranked. Why? One big reason is seemingly non-economic: health. Despite a superficially favourable demography, with higher fertility rates and slower ageing than in Europe, and despite spending 18% of gross domestic product on healthcare, the US throws away its advantage through high levels of obesity and relatively poor health-adjusted life expectancy. A hasty move to abolish Obamacare, as many Republicans favour, would just make things worse. That inefficient health system combined with poor health contributes to the country’s recently poor record in productivity growth. I hadn’t considered it in that way, but the US’s huge health spending (for poor outcomes) is actually a drag on its economy. If it could improve that, other improvements would follow naturally. At a news conference last week, now-President Donald Trump said he and his daughter, Ivanka, had signed paperwork relinquishing control of all Trump-branded companies. Next to him were stacks of papers in manila envelopes — documents he said transferred “complete and total control” of his businesses to his two sons and another longtime employee. Sheri Dillon, the Trump attorney who presented the plan, said that Trump “has relinquished leadership and management of the Trump Organization.” Everything would be placed in a family trust by Jan. 20, she said. Smart: they looked at whether company registration details had been updated. I keep expecting Chromebooks to make inroads into the consumer and business PC market, but they keep on not. Odd, given that many tasks (especially in business) seem as though they could be browser-based – but legacy software is too deeply embedded. I suspect the same is true for consumers: “can run iTunes” matters to a surprisingly large number of people. When researchers went poking in the iOS version, they quickly found a host of red flags: multiple analytics packages, which is software used to track usage and users; requests for data that Apple forbids, some of the code for which was taken directly from a popular iOS programming guide, which prominently notes it shouldn’t be used in production software; and attempts to extract a unique phone identity, which is sketchy based on Apple’s rules. iOS forensics expert Jonathan Zdziarski tweeted his examination of the code, and concluded that it was likely no worse than any other free app that relied on user tracking to aggregate information and sell the results. I attempted to find Meitu’s privacy disclosure online, but its English-language sites are incomplete, and some App Store links go to Chinese-language pages. However, in a statement sent to Macworld, Meitu said that it doesn’t sell any user data. It says it uses everything it gathers to improve the app experience, and derives all its money from in-app advertising. A spokesperson said it is also developing virtual makeup preview filters with retailers and beauty makers, which it would charge for. In China, it’s also engaged in mobile commerce, which hasn’t yet come to most of its other markets. The problem with these apps (particularly on Android, where it tends to be take it or leave it) is that they inure people to just saying yes, what the hell, go ahead. At some point – or already? – something subtly malicious will exploit this, and Bad Things will follow. Sonos makes home speakers — precisely the space that’s getting upended by Amazon’s Echo and (to a lesser extent so far) Google Home. It’s perhaps not entirely fair to say Sonos was blindsided by the rise of digital assistants in the home; but it is entirely fair to say that the company hasn’t reacted quickly enough to their sudden importance. We’ve obtained a slightly redacted copy of the memo that Spence sent to his company immediately after taking over, and it reveals some of what Sonos is going to do to face those new challenges. Namely: it’s going to try to get everybody to play nice with Sonos. Sonos speakers (I own several) are miles better than the Echo; but the company has seemed to be spinning its wheels in the past few years. There hasn’t been anything dramatic since the Play:1 in October 2013. Apple reportedly is planning three new tablets for 2017, a 9.7in iPad with a friendly price range, a 10.5in iPad, and an upgraded 12.9in iPad Pro. The products are still in planning, with the 9.7in model expected to enter mass production in the first quarter, and the other two in the second, according to sources from the related upstream supply chain. The sources noted that Apple is considering having the 10.5in iPad replace the existing 9.7-inch product line and will let the new 9.7in iPad become an entry-level device, mainly targeting the education sector. When I wondered here who would use the iPad mini in portrait mode, the response from iPad mini owners was overwhelming. They all do. So a 10.5in iPad that is effectively two of them stuck together in portrait might be popular. You’ve got mail! That old AOL audio announcement always felt perfectly anodyne — so anodyne that it almost seemed fated to become the hook for a romcom starring Tom Hanks and Meg Ryan. Yet at the same time, and this has become clearer in retrospect, it was a threat. The computerized voice, chipper, friendly, always feigning surprise and excitement at the news it delivered, carried a demanding and judgmental undertone. It was a parental voice. You’ve got mail — and you need to go to your inbox and attend to this new mail quickly. Right now, in fact. Only a churlish, sad, unsociable creep would let a new message sit unread in an inbox. You don’t want to be a churlish, sad, unsociable creep, do you? A threat, and a prophecy. Even as AOL faded away, you’ve got mail burrowed deeper into our consciousness. It became more than a voice in our heads. It became the voice in our heads. It was never a voice of our own — it comes out of the mouth of a stranger, a stranger with an agenda — and yet it now runs through our minds as if on a continuous tape loop. a computer should never ask you a question that it should be able to work out for itself. These alerts and warnings, and all those buttons, are questions. And so, just as Windows doesn’t ask you what sound card you have and smartphones don’t ask you where to save a file or what your password is, what is a back-up warning but a question – do you want to stop now? Really, a car shouldn’t have a back-up warning – it should just rubber-band to a halt. And that, in turn, is a step to autonomy – to level 3 and 4, the car that will try not to let you crash, and will increasingly drive itself. That is, the end-point is to have no interface at all. In a fully-autonomous, ‘Level 5’ car, with no steering wheel or manual controls at all, the only human-computer interface is when you say “take me home now”. But most people in the autonomous driving field think that’s at least 5 years away and more probably 10, or more. In the mean time we have a transitional phase, as you go from lots of warnings to one and you ask what fundamentally that warning should be, and as you sit in a car where you need to be in the driving seat and steering, mostly, or ready to steer, but the car might stop you, or drive itself. Something that drives itself until it doesn’t can easily become dangerous. So, my struggle to turn off the HUD on my borrowed car might become something rather more urgent. This could, incidentally, be the best car opportunity for Apple. A car that you just tell to go home and forget about is Google’s sweet spot, without much scope for Apple to add any unique insight as to how the experience should work. Conversely, a car that you still need to drive, somehow, but in radically new ways, seems like a fruitful place for thinking about how interfaces work, and that’s Apple. I’d love a reversing system that stopped me reversing too far. [Facebook’s] Messenger platform ended up being too locked down and the distribution avenues too weak to generate the hoped-for opportunities for developers. This failure can either be seen as a realistic and necessary casualty of scale, or a major misfire in Facebook’s quest to monetize the Messenger platform. Amazon clearly leaned a lot further into the Echo and the bot platform it hoped to develop on top, to make it a more valuable and defensible ecosystem. You know Amazon is pushing something hard when every box you get from them is wrapped in ads for its bot platform on the tape. The product seems to be very well-liked and selling well. (I have five at home.) But having spent time developing some things on the platform, I can tell you that Amazon to date has made it very difficult for developers to distribute software on the platform and has failed to provide the discovery mechanisms that would allow new developers to flourish. So the Echo, while continuing to be promising, in practice remains a very good alarm clock that can tell some jokes. Google was relatively late to the consumer-facing bot party this year, but with the announcement of its Assistant product, its “Home” Echo competitor, and Allo, it has meaningfully tossed its hat into the ring. Google has not, however, been pushing the developer or ecosystem story as much as just creating great services—at least not directly. That might turn out to be the right strategy.